If you somehow manage to avoid the sophomore slump in music, all eyes immediately shift to see if there’s the junior jinx. 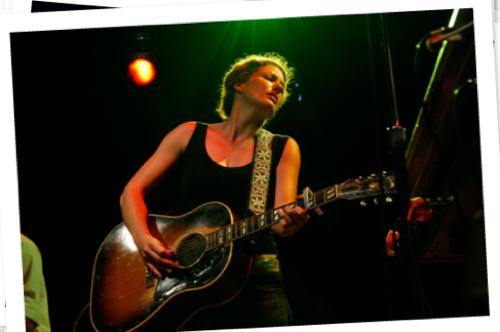 Kathleen Edwards avoided that slump by creating a more nuanced and textured version of her debut with Back to Me in 2005, but you can only reshuffle the same deck so many times. Her third album, Asking for Flowers, plays down the rockier elements of her first two albums in favor of a more maudlin, less insular set of songs that add up to a tremendous album, even if none of the individual songs match her past high points. 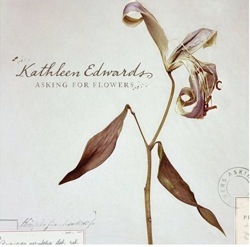 The album opens with “Buffalo,” a spare, piano driven song at the outset, further pushing the more maudlin feel of the record – a far cry from her first two album’s twin firecracker openers of “Six O’Clock News” and “In State.” Quietly squeaking piano pedals pulse under the opening chords as Edwards sings: “The summer months left me alone…have you ever seen lightning and snow?” The often chaotic nature of relationships in Edwards’ first two records here are dampened by a turn outward, an attempt to look up and out that dominates a good third of the album. The gorgeous title track and “Oil Man’s War” pick up the voice of narrators outside of Edwards. They experience crippling depression and mental issues (“Asking for Flowers”) and a pair of people who flee from having to fight in the Iraq conflict (“Oil Man’s War”). While Edwards has put herself in other’s shoes before, this is a more intense exploration of that idea. “Alicia Ross” and “Oh, Canada” represent a sharp tandem of songs that show Edwards casting a culturally critical eye at her own country and does so in a way that is an honest and impressive examination of duality. To some extent, Alicia Ross was Canada’s Natalie Holloway, a younger white girl who goes missing and sets off a media rampage about her whereabouts. (In Ross’ case, however, it was eventually solved – her neighbor had killed her and taken the body 70 some miles away.) The song is written from the late girl’s perspective and is a trembling, beautiful song that is relatively haunting given the actual events that inspired it. Then, five tracks later, “Oh, Canada” eviscerates the very system that documented Ross’ disappearance in the first place, replicating a complaint often heard about media here in the States: “We don’t say it out loud / There are no headlines / When a black girl dies / It’s not the lack of a sense / It’s called ambivalence.” The two sentiments are a paradox – a seeming contradiction that actually holds a solid truth and it’s a powerful thematic punch. While there are no songs that immediately rival “Independent Thief” or “Summerlong” on this album, there are two that make a serious dramatic impact. “Run” starts off as a slightly funky keyboard riff that soon develops into one of the album’s most haunting vocal choruses and “Goodnight, California” closes the album with more than six minutes of haunting, string laden melancholy. It gives a long goodbye to an album that certainly begs, nay, insists on moments of reflection, lyrically and musically. I really want this record but it’s not out in the UK until the end of April. Grrrr. I thought we had the whole global economy thing happening. That CBC snipe is funny because i think she sang it live and in person in the CBC yesterday afternoon..
Great review… and a great album. Keep up the good work. I would venture to say that the song Asking for Flowers is up there with Summerlong or Independent Thief. Nice review. The Marty McSorley line in “I make the dough..” is excellent. I liked highlights on Failer more than Back to Me, and I like this album more than Back to Me too. The songs are more subtle…I agree the best are the tracks which don’t jump out to you on the first listen. Alicia Ross is beautiful, and I like Run, Scared At Night and Asking For Flowers a lot too. Can’t wait to hear them all live. I’m a big fan, and I love the new CD!